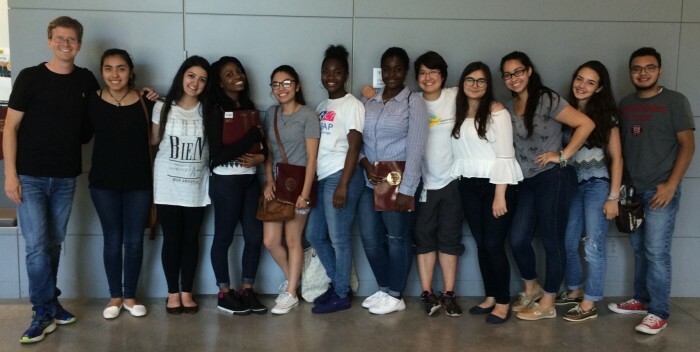 APPLICATIONS FOR THE 2018 SUMMER LEARNING LAB ARE NOW OPEN! Thank you for your interest in the Summer Learning Lab. You may submit an application to the Summer Learning Lab by CLICKING THIS LINK. The Summer Learning Lab in the Molecular Genetics of Aging is an experiential learning module for young students of biological and medical sciences. The Summer Learning Lab opens its doors to current high school students (or very recent high school graduates) for three weeks, to explore the fundamental question of how genes influence the rate at which cells and organisms age. 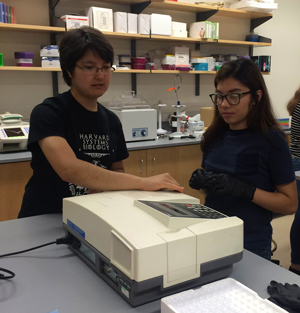 Students enrolled in the Summer Learning Lab develop skills in laboratory techniques (such as pipetting and microbial culture,) as well as data visualization and analysis. Students learn first-hand lessons in cell biology, genetics, and the biology of aging. Students generate authentic scientific data, and contribute real experimental results to the scientific community by discovering new genes which affect the lifespan of baker’s yeast, Saccharomyces cerevisiae. The program is now in its third year, and we have added a lot of new molecular experiments and curriculum. Please direct any inquiries regarding the Summer Learning Lab to the course director, Dr. Christopher Burtner, at christopher_burtner@hms.harvard.edu. We are happy to share our protocols and curriculum with interested high schools and universities. Please see below for pictures of our 2016 students hard at work, and the data they generated! (Left) Students pipette their yeast cultures into the 100-well BioScreen plate. The BioScreen generates yeast outgrowth curves that students use to calculate yeast lifespan. (Right) Loading the BioScreen plate was a daily task. Students got a lot of practice pipetting small volumes of yeast into the wells. (Left) A student takes an absorbance measurement of their yeast dilution (Above) Students analyze their yeast growth curves in Microsoft Excel. Learning how to use Excel and perform data visualization is an important part of data analysis! (Below) Lifespan data generated by the students. (A) The deletion in the genes ARO9, PEX12, HST3, YJR056C, and DAL2 all result in an apparent life-span increase compared to a wild-type yeast strain. The lifespan extension gene deletion in DAL2 is particularly interesting, because it appears to be as long as the wild-type strain grown in low-glucose. 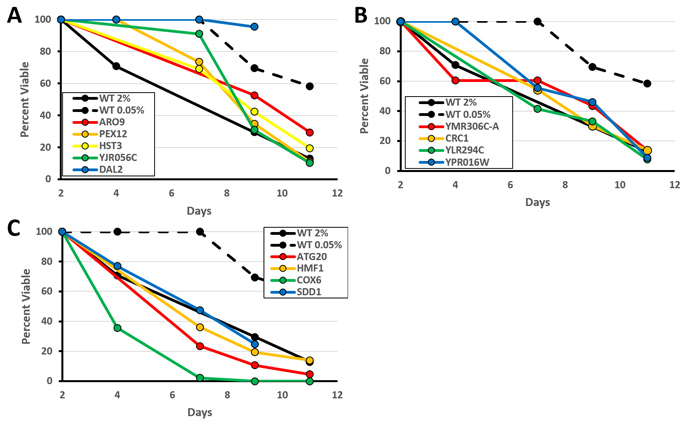 (B) Deletions in YMR306C-A, CRC1, YLR294C, and YPR016W had lifespans that were comparable to the wild-type control. (C) Deletions in genes ATG20, HMF1, SDD1 and COX6 were all short-lived. ATG20 is involved in autophagy, which is a survival mechanism in nutrient-deprived cells, and COX6 is required for respiration. Based on gene function, it is not surprising that these are short lived.